The United Arab Emirates (UAE) is one of the world’s biggest international business hubs and a friendly environment for all kinds of start-up businesses. Its commercial interests include real estate, airlines, financial services and, of course, tourism. The UAE also aspires to become a center of health tourism. Today, business developments in the UAE are geared towards a growing technology sector, artificial intelligence, and renewable energy. The new system finally permits long-term stays in the UAE for people with valued skills. Early 2018, the cabinet introduced residency visas covering up to 10 years for a range of fields in medical, research, technical and science sectors. It is expected to help a wide array of people including students in STEM, entrepreneurs, business investors and those who fulfill certain specially selected professional talent conditions in art and culture, and science or innovation. These residency visas are also extended to spouses and any children they may have. However, there are strict eligibility criteria for each group. 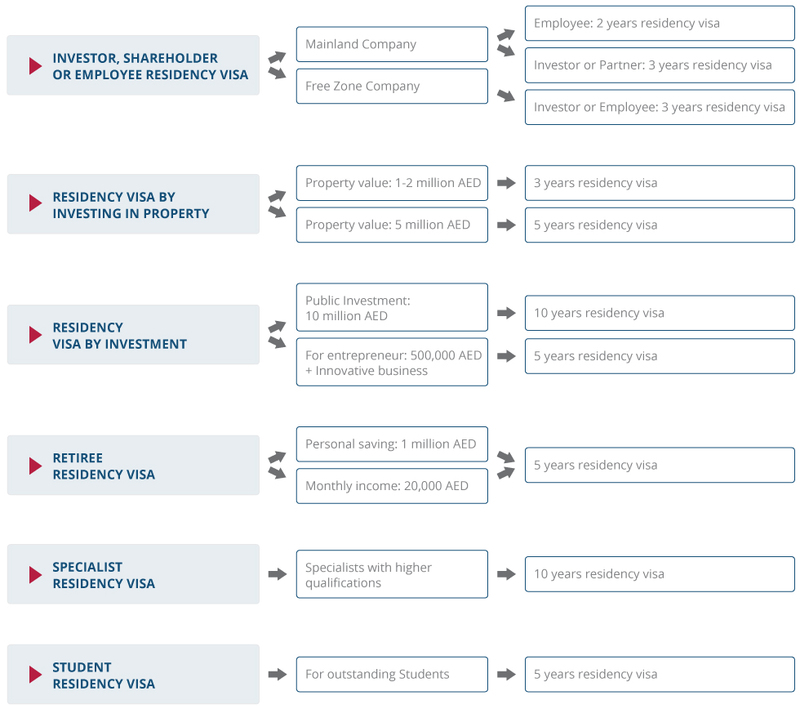 Obtaining a Long-Term Residency visa or which residency visa you may apply for depends on the reason for which you are applying for the residency visa. You may obtain this residency visa by registering a company in the mainland or within one of the more than 65 Free zones in the UAE, as well as by being an employee in a company. It is easy to obtain a residency visa and it is renewable for many years. A 3-year residency visa is available if you are investing in a property worth between AED 1-2MM. A 5-year residency visa is available if you are investing in a property worth over AED 5MM. A 10-year renewable residency visa if your investment area is public works, through a business (company or partnership), or a combined investment of a mix of no less than AED 10MM. The figures stated here must represent owned assets and may not consist in loans. An investment is required to be made for a minimum duration of three years. For partnerships, a minimum of AED 10MM is required from each partner. Applicants are permitted entry for up to six months at a time, as with the entrepreneur residency visa. A 5-year multi-entry residency visa for those with evidence of prior projects and a minimum investment of AED 500,000 or for those with approved accreditation from a UAE business incubator. If the other requirements are met, the applicants may also be eligible for the investor’s residency visa. The entrepreneur may stay in the UAE for up to six months at a time with a possible renewable extending by a further 6 months. Personal saving with an amount not less than AED 1MM. Monthly income of no less than AED 20,000. As well as the eligibility for the investing on property residency visa (depending on the value of the property). 10-year residency visas are available to a range of STEM professionals. Doctors and specialists must have a Ph.D. with 10 years of practice experience, hold an award of appreciation from the country of origin, and evidence of major contribution to research sector, published articles, and professional membership. In addition, they must hold qualifications in a field deemed a priority for the UAE. For a 10-year residency visas for specialists in the creative fields including arts and culture. Applicants are required to obtain accreditation from the Ministry of Culture or Knowledge Development Investors. They will be required to obtain a Patent of Value from the Ministry of Economy Exceptional Talents list. A valid employment contract is required prior to the residency visa application. Students who secured an outstanding grade of 95 % in secondary school and have maintained a GPA of at least 3.75 from the university can apply for a five-year special student residency visa. Dubai’s modern, forward-looking infrastructure: Zero tax on incorporations in Dubai has allowed the Emirate (and others like it) to develop a robust social, industrial and commercial infrastructure. Every business visit to Dubai brings something new. Dubai boasts some of the best roads, public transport, international transport, communications and emerging technologies anywhere in the Middle East, if not in the world. Low crime, cosmopolitan lifestyle: Unlike some of the other jurisdictions with liberal tax and incorporation approaches to setting up a business, the UAE is one of the safest countries in the world as far as crime is concerned. Streets are safe and with a cosmopolitan society welcoming peoples from 200 nations, it’s also a great place to make new business contacts with global outreach. World-class tourist’s destination with the world’s tallest building and the 3rd largest mall. A wide range of insurance services (medical, life, auto …etc. SFM Corporate Services is a global company, with offices in four countries and with a dedicated staff of more than 50 people, SFM’s origins are in the Swiss banking and finance sector. With the Swiss mantra of “the client comes first”, SFM offers incorporation services no matter where you are in the world. Our extensive experience and in-depth incorporation knowledge mean SFM can offer client-focused expertise to the incorporation market across the United Arab Emirates. We have more than 15 years of experience, so clients can rest assured of our knowledge and professionalism in handling the incorporation process. We offer a dedicated relationship manager, specialized in the field of corporate services and administration, as a point of contact throughout the year. We offer a one-stop-shop, a single point of contact, and a turnkey solution to leading organizations, helping people set up their business in Dubai. For many years, we have been operating in the UAE and following the rules and regulations on company formations, helping foreign investors acquire residence in Dubai, and aiding a smooth transition to company formation.